Just eight years after hosting a successful Winter Games, the City of Leduc was awarded the 2016 Alberta Summer Games. “I am very pleased to announce the City of Leduc has been awarded the 2016 Alberta Summer Games,” Alberta’s Minister of Tourism, Parks and Recreation, Dr. Richard Starke said during the announcement ceremony at the Leduc Recreation Centre’s Co-op Field House on May 15. More than 3,000 athletes between the ages of 11 and 17 will compete in such tradition summer sports as basketball, swimming and soccer. “The Alberta Summer Games are an opportunity to showcase our provinces talented young athletes as they compete at an elite level in their respective sports,” said Starke. Started in 1986 not only do the Games showcase elite athletes and act as a spring board for national and international events, but, Starke said, they encourage and inspire people to get involved, become more active, hone skills and lead healthier lives. “Participating in sports at any level develops self-confidence, fosters fairness and team spirit and builds resilience,” said Starke. As for host communities, it builds civic pride, strong communities and provides an economic boost. Leduc Mayor Greg Krischke said, he’s proud that Leduc was selected to host the 2016 Alberta Summer Games, but it couldn’t be done without the partnership of Leduc County, the Black Gold School District, and Thomas Aquinnis Separate School District the Edmonton International Airport, the local business community and the volunteers who will be needed to make the games successful. Leduc-Beaumont MLA George Rogers was on hand to express his pride in Leduc for having been selected. 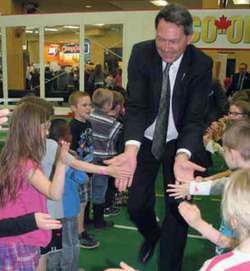 In addition to announcing Leduc had been selected, Starke told those gathered, the Alberta Sport Connection, which operates the Alberta Games on behalf of the provincial government and works closely with the host community, the ASC is providing Leduc with a $420,000 grant to go towards planning organizing and hosting the events.